There's only one thing hotter than a lowly No. 15 seed plowing into the Sweet 16 of the NCAA basketball tournament. That would be the head coach of a No. 15 seed that has upset two bigger college basketball teams in front of millions of bracket-wielding fans across the nation. 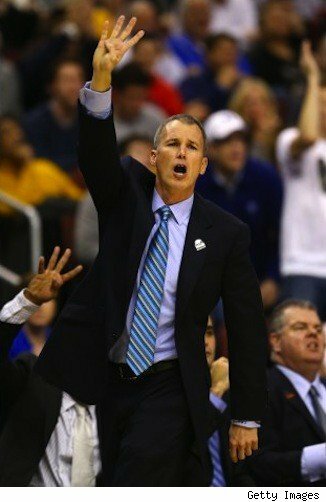 That hot coach is Florida Gulf Coast University Coach Andy Enfield, whose unsung Eagles stunned No. 2 Georgetown and No. 7 San Diego State in Philadelphia in the NCAA tournament over the weekend to become the only 15th-seeded team in tournament history to make it past the first weekend of high-wire action. Talk about March Madness. This is a college basketball program that did not exist 10 years ago because Florida Gulf Coast University only opened its doors to students in 1997. And just as FGCU's ticket got punched for another round of action, when the Eagles face cross-state "rivals" Billy Donovan's Florida Gators, so has the profile of Enfield been raised -- to the roof. How hot is Enfield? Hot enough to cause major speculation about where he's going next, especially now that we've discovered via Gossip Extra that the 44-year-old Enfield has been trying to sell his Fort Myers, Fla., home. Did someone say "job offer"? Well, no one knows ... yet. And as has been pointed out, the home has been listed on the market since November 2011, just months after Enfield bought the place. For anyone unfamiliar with the rabid nature of rumor-mongering during the Final Four regarding potential coaching moves and which Division I players will declare themselves eligible for the NBA draft, let's just say that Enfield's house being up for sale is like red meat before lions. That's especially true since Enfield and his wife just purchased the four-bedroom, 3.5-bathroom home. And that's especially true since the home is now listed for $675,000, which is 50 grand less than Enfield paid for the 3,400-square foot home that boasts all the amenities you'd expect in a gated community, including its own pool. Of course, this real estate listing likely has no bearing on Enfield's future or fate. Enfield doesn't necessarily need the money from a bigger coaching position, since the former Johns Hopkins basketball star went on to train basketball players (about how to improve their shooting) before forming two companies that both brought him big financial returns. The self-made millionaire and his wife, Amanda Marcum, a former supermodel, may just be shopping around for something bigger in Fort Myers to better suit the needs of their three children. Or, it could be true that Enfield is at the top of every coaching vacancy list. Enfield's pedigree and quest for success probably has athletic directors across the country thinking up ways to lure this hot talent. For instance, the University of Minnesota unceremoniously fired Tubby Smith immediately after the Gophers were ousted from the tournament. UCLA also needs a new coach. The answer to whether Enfield's looking to buy another home in Florida, or if he's shipping out -- and up the college basketball food chain -- will only come after Enfield's upstart Eagles have danced their last dance for the season. Find more homes for sale in Fort Myers, Fla., or search listings in your area.